Cash-strapped pawn shop chain Albemarle reveals a slump in full-year profits, a week after putting itself up for sale. It has been claimed that pawn shops and betting outlets are contributing to the death of the high street as we know it, but Albemarle & Bond is proof that not all pawnbrokers have profited from the recession. 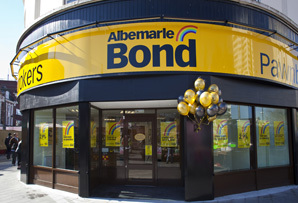 Albemarle & Bond, one of the UK’s biggest pawnbrokers, has suffered from a 27% slump gold prices since March and a 12% drop in pawned items. As a result, the firm announced today that profits in the year to June slumped to £4.9m, from £21.4m the year before. In the last six months the company has been trading at a loss; and, with net debt of more than £50m, it is coming close to its borrowing limit of £53.5m. However, the firm was given a three-month reprieve by its bank at the end of October to get itself straightened out by February. Last week the pawnbroker said that was exploring a sale of the business after the sharp drop in its fortunes. The 35-year-old firm, which embarked on a rampant expansion plan of its gold buying business, has now shut all loss-making gold stores. Albemarle, which also trades as Herbert Brown, has reduced the size of its portfolio from some 230 sites to under 200, having closed its 33 pop-up gold buying stores. The group was forced to abandon a £35m rights issue after American pawnbroker EZCORP, which owns 30% of the company, refused to underwrite the 50p-a-share sale. Albemarle also revealed it had been forced to melt down its gold reserves to raise emergency cash (although former CEO Barry Stevenson still managed to depart with a pay packet of £631,000 in April). Ending a torrid year for the pawnbroker, its share price has tumbled by 94% since December 2012. Albemarle has also seen a mass exodus of board directors, with five of its six non-executives recently quitting with immediate effect. The business is now up for sale, with rivals in the pawnbroking industry said to be eyeing up the company. EZCORP is also tipped as a bidder for the business.